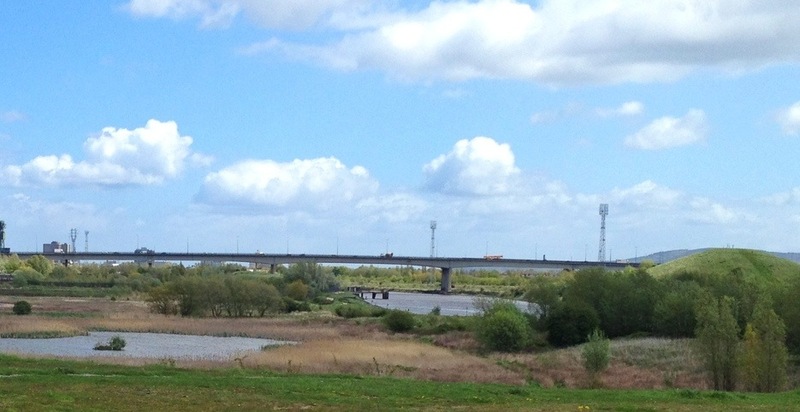 This is a bit of the 2.9km A19 Tees Viaduct. It was built to cross the Tees at an appropriate height for big ships to pass beneath, yet since the port at Stockton was virtually disused at the time the viaduct was built, that specification probably wasn’t necessary. Only 15 years after it opened, the nearby Tees Newport Bridge was fixed in its lowered position, blocking any river traffic anyway. Most days, mine is one of the almost 90,000 cars that use this 37 year old structure. It’s the largest bridge of its type in the UK, but is prone to frequent congestion at peak times as it’s operating at a capacity way that for which it was designed. Mini-steps like ramp metering and CCTV monitoring have been taken to try and deal with the congestion, but with more and more vehicles using the viaduct each year, it seems likely that something more drastic will have to be done before too long. This 1,652nd post was filed under: Photo-a-day 2012, Driving, Stockton-on-Tees, Transport.